On the tenth of the Twelve Days of Christmas at The Restaurant at Meadowood, Christopher Kostow gave to me David Toutain, the french chef who made l’Agapé Substance in Paris famous in a very short amount of time. Named the Revelación del Año at the recent Gastronomika conference in San Sebastian, Spain, Toutain has received an incredible amount of attention and press from around the globe. A couple of months ago, he announced that he was leaving l’Agapé Substance. At a question-and-answer session at the Culinary Institute of America at Greystone this past week, I asked him about his future plans. He says he’s unsure where he wants to land, but he’s certain that he wants to take a year off and travel with his wife. Like many other chefs with whom I’ve spoken in the past few weeks, he considers travel educational, and an invaluable source of inspiration. The tenth visiting chef at the Twelve Days of Christmas, Toutain, together with hosting chef Kostow, served an eight-course dinner paired with wines (and grappa) from Araujo Estate. 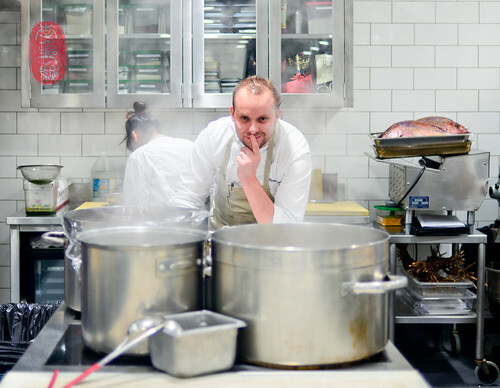 David Toutain’s culinary pedigree is evident in his cooking. 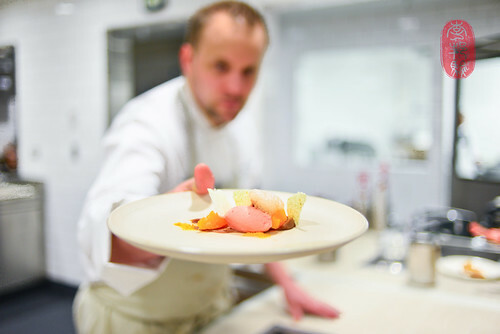 Although he was raised in rural France and started his career in humble kitchens in Normandy, he went on to work under some of the most avant-garde and progressive chefs in the world, including Andoni Aduriz at Mugaritz in Spain (where he met his wife Thai), and Paul Liebrandt at Corton in New York. You will find, for example, traces of his avante-garde training in his cooking – calcified salsify, and alginate potato gnocchi, for example (he served both at the dinner). But, my favorite Toutain dishes from this dinner were the simpler, more comforting ones, like one with warm strips of tender cuttlefish and melted wild leeks splattered with squid ink (this dish might be more reflective of his time working under Alain Passard at l’Arpège). I also loved Toutain’s smoked eel, which he bruléed and served on a bed of velvety black sesame sauce. Hidden in the inky sauce were crisp dices of tart green apple that really brightened up the otherwise dark flavors. Kostow served a beautiful filet of snapper à la Grecque. I loved the vinegary tang of the sauce, poured table-side, and the crunchy snapper scales he scattered over the fish. Another highlight was the Restaurant at Meadowood’s pastry chef’s huckleberry ice cream with cinnamon, pecans, and eucalyptus. It had a warming, winter-hardiness about it, yet it was incredibly refreshing at the same time. It was beautiful too. I loved it. The wines from Araujo Estate are lovely, and the vintner, Bart Araujo, and his wife Daphne, are even lovelier. I’d love to visit their winery some day soon. You’ll find the entire menu from the Twelve Days of Christmas dinner with David Toutain, and a slideshow of the dinner below. ~ by ulterior epicure on December 22, 2012.